The Royal Cliff Wine Club was launched on 28th April 2001 to show the resort’s enthusiasm for promoting wines and hosting wine-related events. 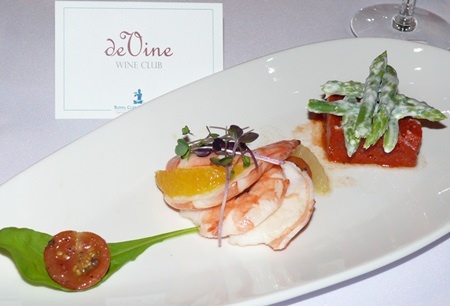 It has enjoyed tremendous success from its very first function, and 14 years later is known simply as the deVine Wine Club. To back up its position as Thailand’s premier wine club, the Royal Cliff cellar has more than 36,000 carefully selected bottles in its inventory, including over 1,000 of the world’s best new and old world wine labels and 15 varieties of the resort’s own label selection. The wines in this selection hail from some of the world’s best wine producing regions and are exclusively made and bottled for the Royal Cliff Hotels Group. Line-caught Atlantic Cod fillet – to clear up Miss Terry’s confusion, line caught is more environmentally friendly, as netting fish often kills other species unintentionally. In addition, in 2009, the resort was bestowed five “Best of Awards of Excellence 2009” from the prestigious Wine Spectator magazine, making it the first hotel resort in the world to be honored in this way. This wine dinner was titled “A taste of Veneto”, offering the deVine Wine Club members the opportunity to experience wines from the Northern region of Italy. The first course of the evening was a King prawn carpaccio laced with lemon oil and a delightfully crunchy asparagus and taken with a Sante Rive Soave DOC 2012. The evening began at 6.30 p.m. with a cocktail reception at The Bar at the Royal Cliff Beach Hotel with a Freschello Rosata NV as the reception wine, taken with Chef Walter Thenisch’s home made antipasti. Dinner was served at the Royal Grill Room & Wine Cellar. The Royal Cliff GM Antonello Passa opened the evening in the Grill Room by addressing the “fellow wine enthusiasts” and welcoming them. He then introduced the speaker and guide Michele di Lorenzo, a most buoyant and enthusiastic Italian. 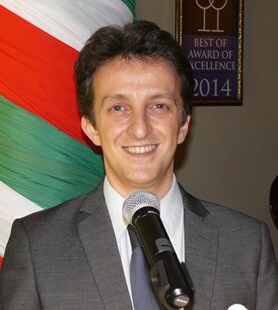 The guest speaker and guide was Michele di Lorenzo, a most buoyant and enthusiastic Italian. He spoke with conviction on the excellent Italian wines from one of Northern Italy’s largest wine producers, the Cielo e Terra Winery, which accounts for 25 percent of the Veneto production. The first course of the evening was a King prawn carpaccio laced with lemon oil and a delightfully crunchy asparagus and taken with a Sante Rive Soave DOC 2012. This was a complex wine featuring a very long finish. However, the next white was a Pinot Grigio IGT 2012 which everyone enjoyed. An excellent wine teamed with the Carbonara pasta parcels. 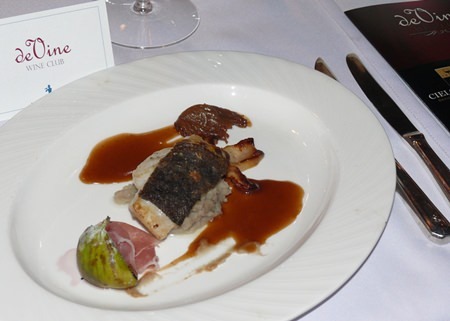 The following course was very interesting, being a line-caught Atlantic Cod fillet with porcini mushrooms, figs and Parma ham. (To be honest, I don’t think I could tell the difference between line-caught and netted, but I am sure Chef Walter does know.) The first of the reds came with this, a very nicely rounded Cabernet Sauvignon IGT 2012; however, it was overshadowed by the following Sangiovese IGT 2012 which accompanied a Victorian lamb loin with Roman style gnocchi, but always remember that wine appreciation is a personal characteristic. The dessert course was another of those fabulous artistic creations, which must have taken ages to complete, and then watch it smashed to pieces and eaten! A Prosecco Brut DOC NV finished off the night, although I would probably have preferred to have a Prosecco as the reception wine. Thanks were recorded to the Royal Cliff led by Panga Vathanakul, BNK Pattaya Wine Gallery, and Berici Hills Winery Group, whose motto is “Cultivating Dreams – Harvesting Passions”. As mentioned earlier, Italians are a very passionate race, and Michele di Lorenzo fitted the description well! A ‘lucky draw’ was held as the finale of the evening, with regular members Chompoo Phanetram and Rabiab Inmee going home with two bottles of Cielo e Terra to be enjoyed at their leisure. 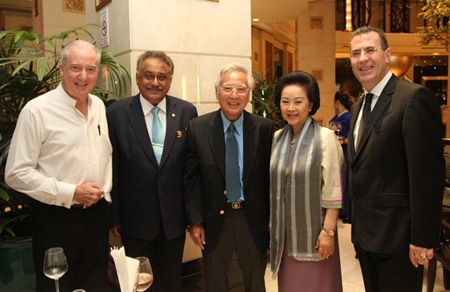 (l-r) Dr. Iain Corness (left) and Pattaya Mail MD Peter Malhotra, Chan Vathanakul, Royal Cliff Hotels Group Managing Director Panga Vathanakul and Acting President of the deVine Wine Club Antonello Passa during the cocktail reception. 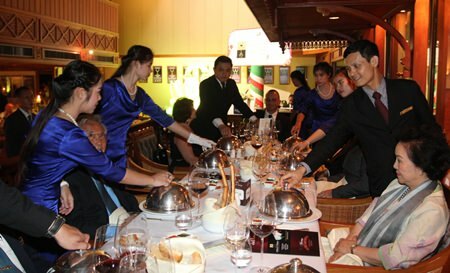 Royal Cliff Hotels Group Managing Director Panga Vathanakul (front right) are seen enjoying the sumptuous dinner and excellent food and wine pairings during Royal Cliff’s “A Taste of Veneto” Italian Wine Dinner. Previous articleCold soup? Yes – Gazpacho!